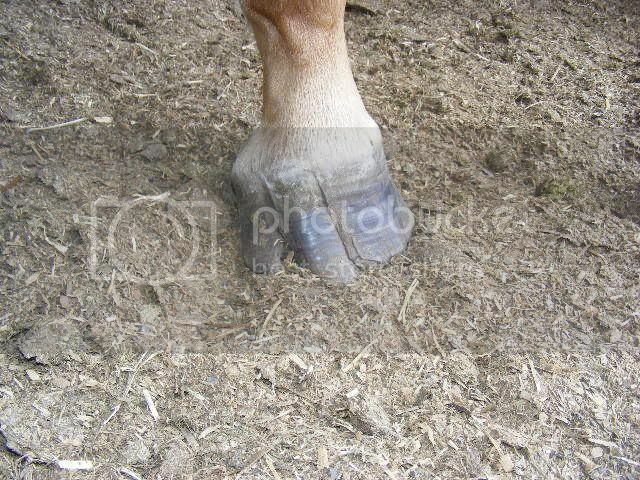 Has anyone had success with a race horse (or serious competition horse), that had/has an injury aquired hoof problem? The horse in question staked up through her hoof, about a third of the way around on the outside of her offside fore. Broke through at the top of the coronet band. And now seems to have a permanent indent at the spot from top to bottom. We are wondering if we should allow her to go barefoot for some time to harden her feet up again. she gets a biotin type supplement regularly. AGM, can you expand - I am assuming that this is now an old injury? Any injury to the coronet band will result in a permanent growth 'deformation' (for want of a better word) as the hoof grows. I have had horses with 'miss matched' front feet, injuries to one front hoof (including quartering etc) that have all gone on to be sound. However, one thing that is so important is a farrier that knows what he/she is doing. Injuries to the coronet band can be tricky, what is the farrier saying? Cheers. Could you post some shots, taken from ground level & a sole shot as well? If I was in Qld I'd be taking the horse where ever I needed to be to have Chris Pollitt look at it. IMO he's the bees knees for feet. Not sure of the protocols, you might need a referral from your regular equine vet or you could drop him a line and see what he says. Thank you for all replies so far. Yes the injury happened as a yearling and she is now a 3yo. There was no involvement with the hoof inside the white line (as far as I understand). Farrier saying just keep a shoe on her, which is hard because she has a terrible habit of ripping them off, regularly . Also it seems a nail can't be put too close to where the line is in the hoof. Sorry i can't provide a photo at the moment as she is several hours away from where i live. We are in Qld joh whereabouts is chris pollitt? Thank you for the referral to the book I will look it up. Apart from the problem with the hoof she is a very solid filly. Not overweight but just solid. She has good bone and overall conformation. Dunno why but I read your original post as her having just injured herself recently so maybe Chris P might be a bit of overkill if she's getting about on it OK but he has been known to come up with some pretty innovative stuff. He's Professor Pollitt these days and to the best of my knowledge is still with the Vet. School at Uni. of Queensland. If she's sound in the paddock then don't die wondering...put her into work! She's not a Warmblood by any chance is she? If she keeps peeling her shoes off then maybe she'd coming too far over from behind and her back feet could be 'squared' to try and stop this? Nails couldn't be put in as obviously this part of the wall is thinner than the rest and he may be afraid that she'll split the hoof, get another farrier's opinion for mine too. Cheers. Had an injury like this last year, the night before a big comp, the mare tore a great chunk out of her coronet and the top of her hoof. Ongoing treatment involved yellow lotion to deal with the proudflesh but the key has been a really good farrier. Initially my farrier put a bar shoe on the horse and watched the hoof over each subsequent shoeing. Because it can't be nailed, special shoes with "clips" are put on that hoof and they stay on better than the ones on the front. It has slowly slowly started to grow down, looks like a great abcess blew out the inside wall of the foot. A good friend is competing on her now but their farrier speaks to mine, its an ongoing management issue, in the paddock she wears bell boots on both her hind feet and paddock boots and we have given her every hoof supplement available as well as rosehips etc. The mare has being shown as a hunter while in recovery and is about to recommence her eventing career and apart from the aesthetics, has shown no side effects. If you have a good farrier, discuss it carefully with them, ask about bar shoes or the shoes with clips, I would be worried about cracks starting from the coronet in the future but by the sound of it, there is no reason why she shouldn't be in work. 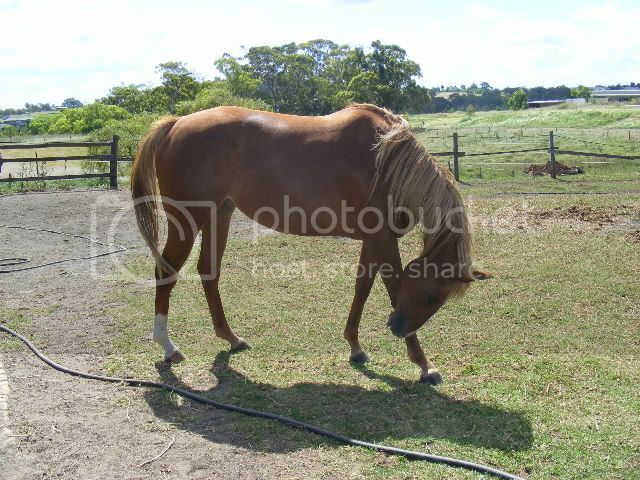 Can anyone tell me how to put up a photo of the hoof? I am pretty technologically illiterate :). Thanks Dahlia. Wish there was a insert photo bit, like on gumtree. so easy. click on that and it takes you into your own photos, pick the one you want and click it and hey presto! good for poor wallies like me hahaha. Hit Preview Post to check it worked. thanks for the help gay! Well done agm You can actually put one below the other on the same post - we live 'n' learn. Now, the important stuff . No wonder you're asking questions!! I'm in no way qualified to 'operate' & only do my own but having had a foot 'fetish' for about 30 yrs, have educated myself as far as I can on foot health & lack thereof! They'll get you started but basically I think the common thread will be balancing the whole foot & relieving the damaged wall areas or any weight bearing so they have a chance to grow down without lateral stress forces. Shoes, imho will only exacerbate the problem. Thanks for that Gay. I bought a book a wee while ago called The Soul of a Horse , and it sparked my thought processes about shoeing and feet etc. Book is mainly about the Monty Roberts methods not shoeing but is a side subject. It goes into wild horse trimming which is partly why i asked my original q.
I am sorry to see your mare had a serious hoof injury. I have a lot of experience with rehabilitation for hoof injuries and work with Equine Podiotherapists in this field. A coronet injury such as this tends to cause a distortion in the hoof wall but that in itself is not necessarily a huge problem if the foot is correctly trimmed to remove the leverage forces that will pry it open at the injury site. What it is necessary to ascertain too though is if there has been any damage to the pedal bone (P3) when the stake passed up through the hoof. If the bone is undamaged and the tendon/ligaments that attach near the injury site are also undamaged then it is possible to regain normal usage with this type of injury. I would have your vet take an exray to determine this if you can. With these type of injuries its VITAL that the horse is trimmed in the barefoot manner no longer than four weeks apart. I cannot stress this more highly. If you leave it longer the horses own huge weight will just flex the hoof at this weak point and add to its distortion. If you look at your pic you will see where the deformed area meets the ground it is already breaking open at ground level. This is due to the horse's weight levering open the seam there when the weak wall meets the ground surface. Just the juge weight of the horse is enough to do that so it must be trimmed in the barefoot manner and that area where the injury is must be bevelled so that it is not having leverage forces placed upon it at ground level. If there are no leverage forces at work on the injury site and the rest of the hoof (and other solar parts that should bear weight) are doing this, then the hoof should remain sound and strong and able to perform hard work. Too early for an update? Filly is going out the pretrainer this week. Do some work going round the paddocks etc. Unshod at the moment been trimmed up and hopefully the feet will keep up. Thanks everyone for advice and comments, I do appreciate it. I will update again when she comes back to town and we can have a good look at her.